SRMS Multi speciality Hospital and Trauma centre, Unnao has most modern 160 bed, centrally airconditioned, Multi Super Speciality, Tertiary Care and a Trauma Hospital established in 2018. The Hospital has 160 teaching beds for teaching & training of students pursuing Nursing & Paramedical.The Hospital is well equipped with facilities to provide quality teaching & training to the students in various departments. Students during their clinical training are exposed to variety of patients so as to make them competent in the field of medicine. During their training students are also exposed to behavioral & managerial skills required in today’s world for becoming a complete medical practitioner. 28 years legacy of SRMS Trust will further enable the students to have an exposure to world class technologies and facilities at 950 bedded multi super speciality tertiary care hospital and trauma centre Bareilly. The hospital is proud to have trust in the society in providing quality medical care to the patients coming from Unnao District and nearby districts. The hospital is running various programmes of National Rural Health Mission (NRHM) like Free Cataract Surgery Programme under DBCS, Free deliveries under Saubhagyawati Matratva Suraksha Yojna, Tuberculosis Programme under RNTCP, Leprosy Programme, Child Immunization Programme, Family Planning Programme and others. 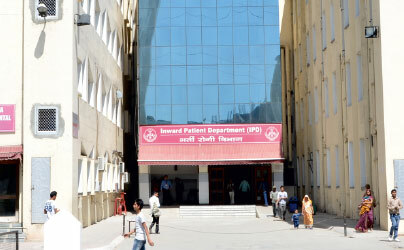 The hospital actively participates in cause for Polio eradication. The Hospital has a 24 hrs Casualty ward and has expertise in Trauma Management with an expert team of physicians & surgeons. 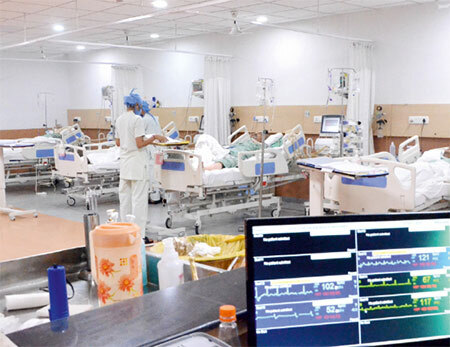 It has the facilities of 20 beds, Treatment Room, Minor OT & Major OT Complex with all necessary equipments for handling emergency like Ventilators, Cardiac Monitor, Mobile X-Ray, Pulse Oxymeters, Defibrilators, ECG machines etc. The OPD is planned in a modular pattern with each department having Consultation Chambers, Reception, Waiting Area , Case Demonstration Room and other necessary laboratories and clinics as required in each department. The OPD timing is from 9.00 am to 2.00 pm and the consultation with the Doctors is free of charge. The hospital has good infrastructure and building having 160 beds for the department of Medicine, Paediatrics, Psychiatry, TB Chest, Dermatology, Surgery, Orthopaedics, ENT, Ophthalmology & Obs. & Gynaecology. Further the hospital has centrally air-conditioned Surgical ICU, Medical ICU, ICCU, NICU, PICU, Semi Private Ward, Private Wards & Deluxe Wards. All Wards have nursing stations, Doctor Duty Room, Pantry, Teaching Area, Examination Room, Toilets for patients & staff and sufficient waiting hall for attendants. 24 hours X 7 days Consultant Critical Care Supervision. Advanced monitoring system for Cardiac Hemodynamics including Flow Trac, Respiratory, Neurological and other factors of homeostasis. Protocols of critical care formulated and implemented as per ISCCM & ESICM guidelines. Bed side Arterial Blood Gas Analysis. Facilities for imaging i.e. X-ray, Ultrasonography, Echocardiography, Peripheral Doppler. Haemodialysis (including CRRT), Endoscopy and Video-Bronchoscopy at bedside. Microprocessor controlled ventilations to provide ventilatory support to both adults and children. Perfusion studies of Brain, Liver etc. The Department also undertook a study on Liver ARFI (Acoustic Radiation Force Impulse) values in Indian population in the month of November. This study is invaluable in assessing patients of Liver diseases such as Cirrhosis of liver. Purchase of Siemens Acuson 2000 USG Scanner is being planned for this purpose. Ram Rakhi Cancer Institute & Research Centre (RRCI & RC) had a humble beginning on 30th September 2008. Functioning under the auspices of Radiotherapy Department, it is equipped with High Energy Linear Accelerator with Multi-leaf Collimators and 30 channel HDR Selectron Brachytherapy equipment with Allenger’s C-arm. 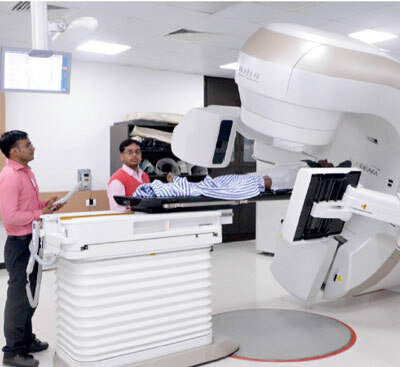 The department is providing state of art Radiotherapy treatment techniques like 3D-CRT for various cancer patients. Besides this, there is an exclusive ward with well-trained nursing staff for giving chemotherapy. The mission of this Cancer Institute is to develop a comprehensive protocol based cancer treatment to all the patients with the support of different clinical departments especially ENT, gynaecology and General Surgery. The department is also focused to make general awareness in public about prevention of this deadly disease. Starting with 2 patients a day, the Department now is treating more than 40 patients every day in a very short span of 3 yrs. 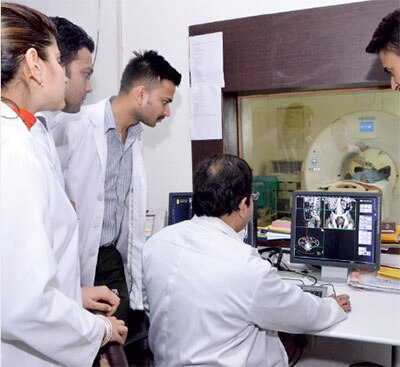 RR Cancer Institute is the second such institute in Uttar Pradesh and Uttrakhand, providing state of the art facilities in the field of cancer.